Goal: Use the WiFi Capacity plugin to emulate traffic from hundreds of virtual stations across an access point and report the results. The eth1 port of our LANforge in this example is connected to the upstream network of the AP. This example uses a LANforge CT523 system but the procedure should work on all CT520, CT523, CT525 and similar systems. In the Port Mgr tab, select the radio wiphy0 and click Create. 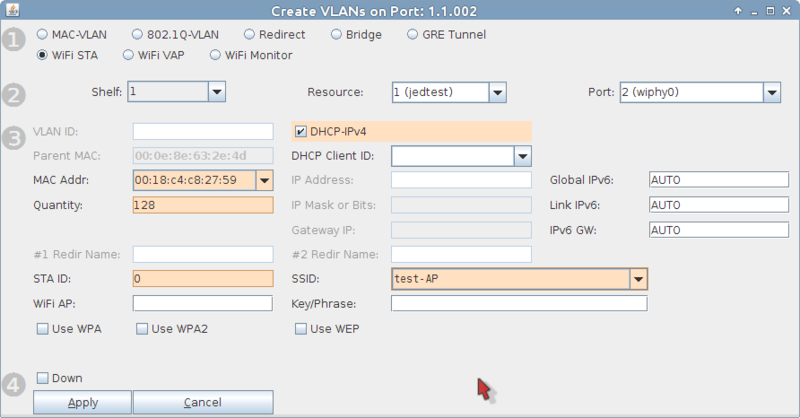 The Create VLANs window appears. Set the values below. In the MAC Addr dropdown, choose RANDOM. Set STA ID at 0. And then close the window by pressing the Cancel button. 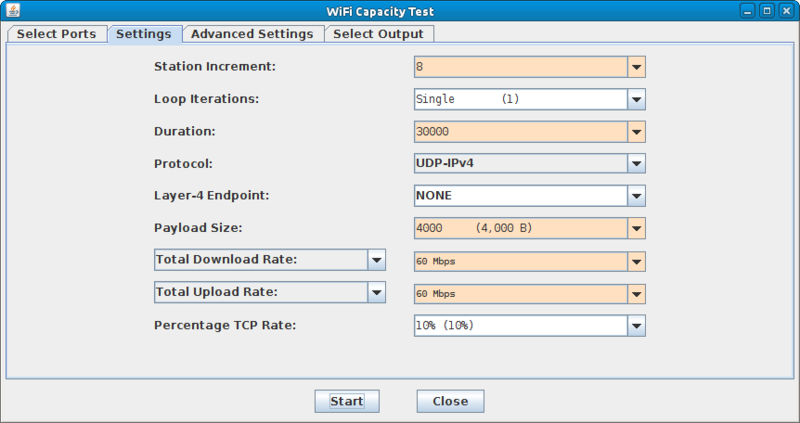 Computing Intervals and Duration: The WiFi Capacity Test is intended to run in multiple intervals. How many intervals is a product of the number stations in the test divided by the interval increment: Intervals = (num stations / station increment). The duration of the test is the product of the number of intervals times the sum of the interval duration plus setup timeout between intervals. Given the setup time between intervals is J seconds, a test of 128 stations with a station increment of 8 and an interval duration of 30 seconds, the entire test duration is: (128 / 8) * (30 + J) = 480 + 16J seconds. The actual setup time depends on two factors: a) If Seek Lower Rates is enabled, which will attempt to test each rate to try and even out connection rates, and b) DHCP performance. Adding piles of DHCP assignments for every increment can take several seconds, and actual performance depends on your test environment. 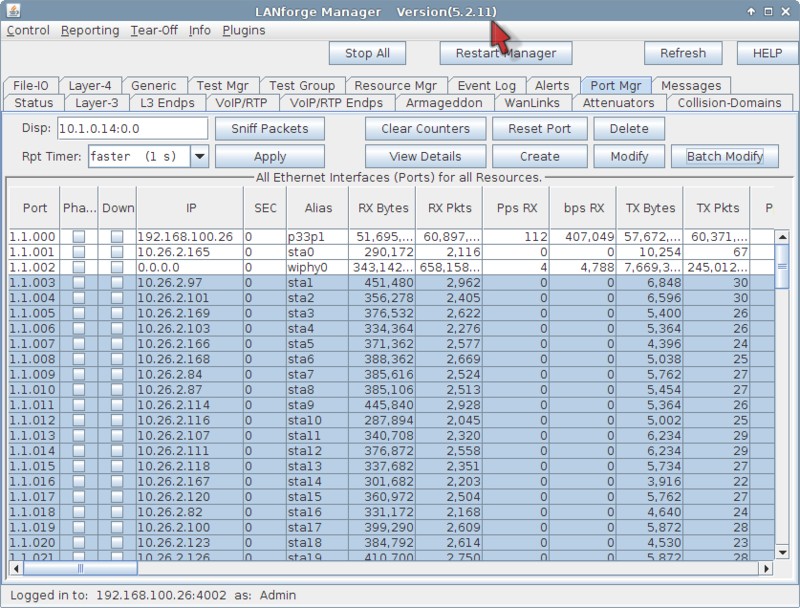 Configuring Routes: the upstream port of your LANforge system should be able to ping the virtual stations. You can use a command from the LANforge command prompt to test this out: ping -I eth1 10.26.2.100 where eth1 is your upstream port on the same switch as the AP, and 10.26.2.100 is the IP of the virtual station. In the eth1 Port Properties window, you will probably want to set the gateway address for the port to the IP of the AP. In this case it is 10.26.1.2. 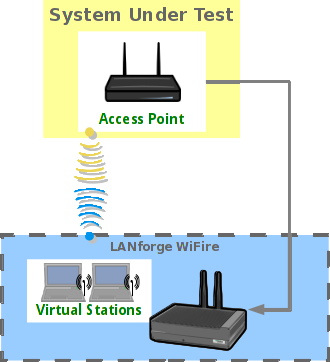 Without this routing configured, the only test performed will be the station-to-station test. 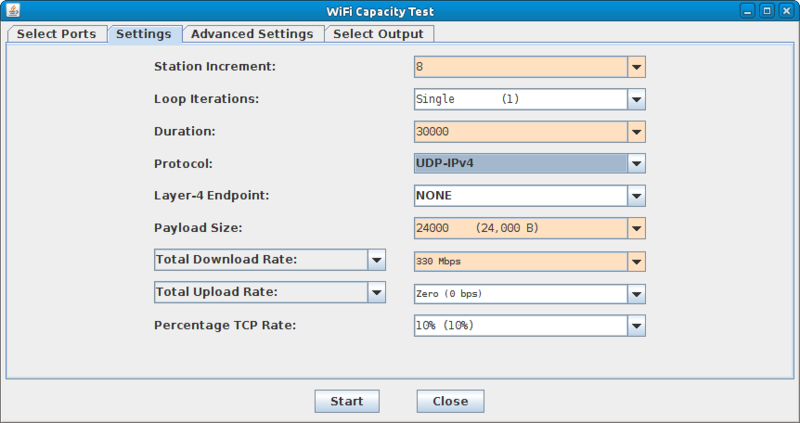 In the Plugins dropdown menu, select WiFi Capacity Test, then begin to configure ports for the test. Highlight free ports that you want to add to the test, this includes the upstream port eth1 and the virtual stations sta0 - sta127. Set Station Increment to 8. This will run 16 intervals with 8 stations added each time going up to 128 total. Set the increment Duration to thirty seconds (in milliseconds) so 30000. Select UDP-IPv4 for the Protocol. For the Payload size select 24,000 B.
Configure the Download Rate at 330 Mbps. 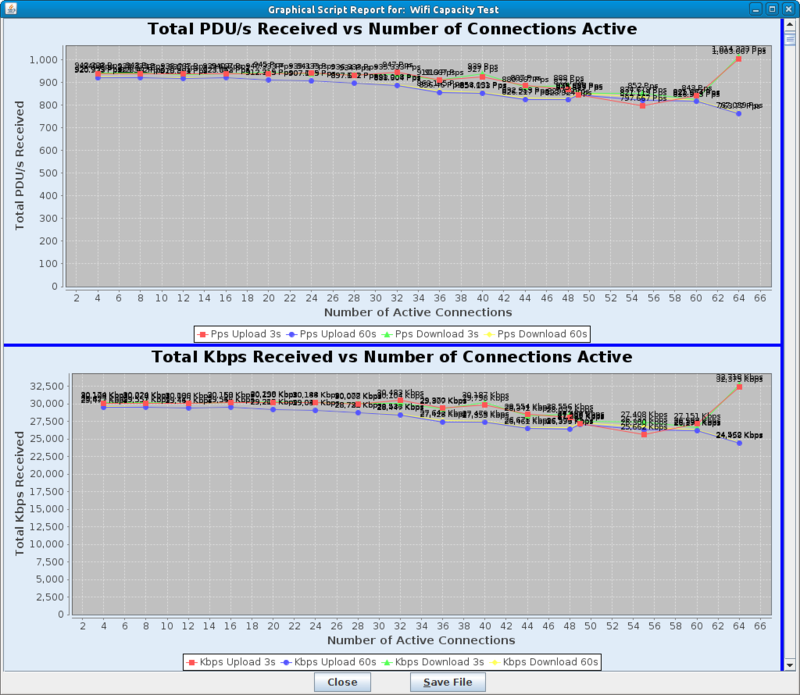 The theoretical maximum for AP throughput on one radio is about 340 Mbps with perfect conditions. Even 330 Mbps might not be achieved. 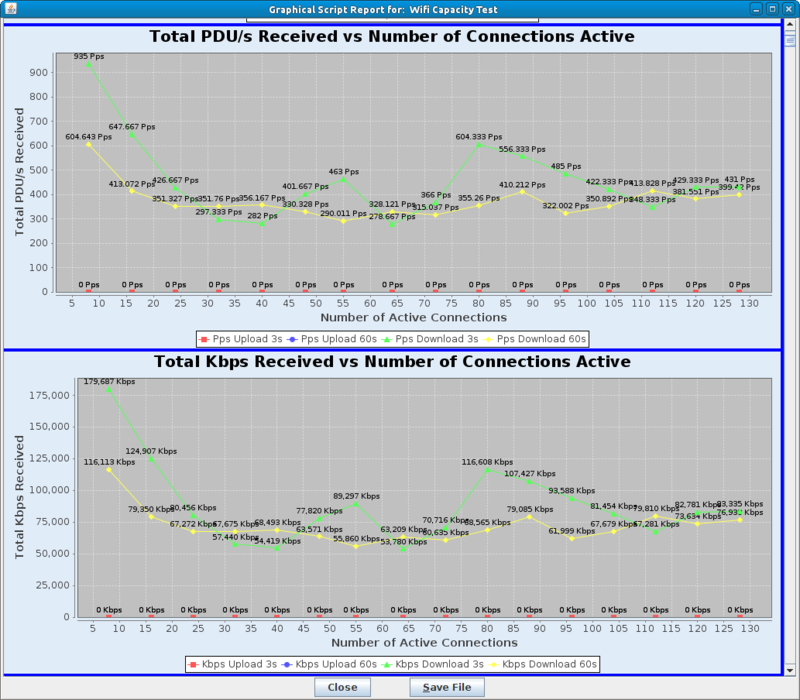 This download rate is the rate requested of the AP by all the virtual stations. 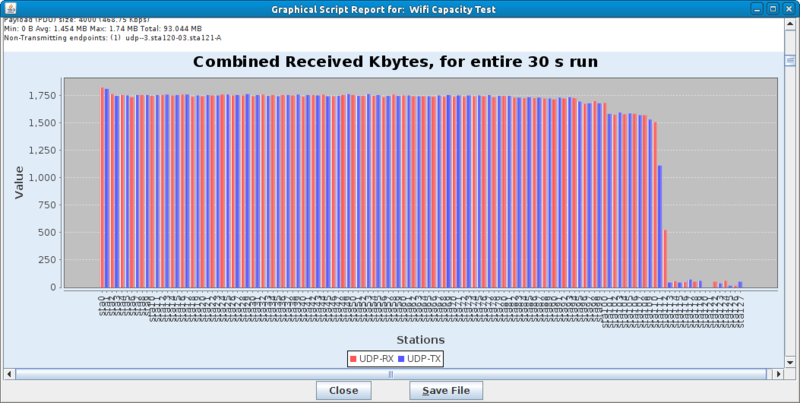 With eight virtual stations, the target download rate per station is 41.25 Mbps. In Advanced Settings, set a Socket Buffer of 1MB. Deselect Try Lower Rates. This will reduce interval setup time. You will see a Graphical Test Results window appear. It will update every test interval. 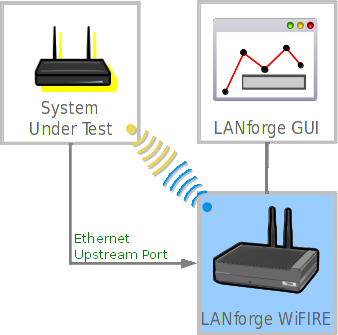 For more information see LANforge GUI User Guide: Plugins:WiFi Capacity Test. Go to the WiFi Capacity Test window. This test is very similar. We remove the upstream port eth1 from the Ports in Use list (in the Select Ports tab). We then configure the traffic to use smaller TCP packets. In the settings tab, set Protocol and Payload to TCP-IPv4 and 4000 B. Change Total Download and Total Upload rate to 60 Mbps and 60 Mbps. These settings should allow up to 120 Mbps between two stations, which will clearly saturate an AP. You will see a Graphical Test Results window appear. It will upon each test interval.